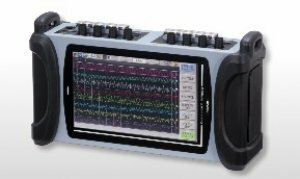 The compact RM1100 Portable Data Recorder from A&D (formally AVIO / NEC AVIO) provides reliable data collection in challenging rugged environments. A large 7" TFT LCD colour touch screen display and refined GUI are ideal for quick setup, data capture and playback. Coupled with "Realtime", "Memory" and SD card recording modes plus up to 1µS sampling rate, the RM1100 handles the most demanding high speed applications. Recording to SD Card or PC via Ethernet ensures long time continuous recording. Waveform printing is available with the optional thermal printer. 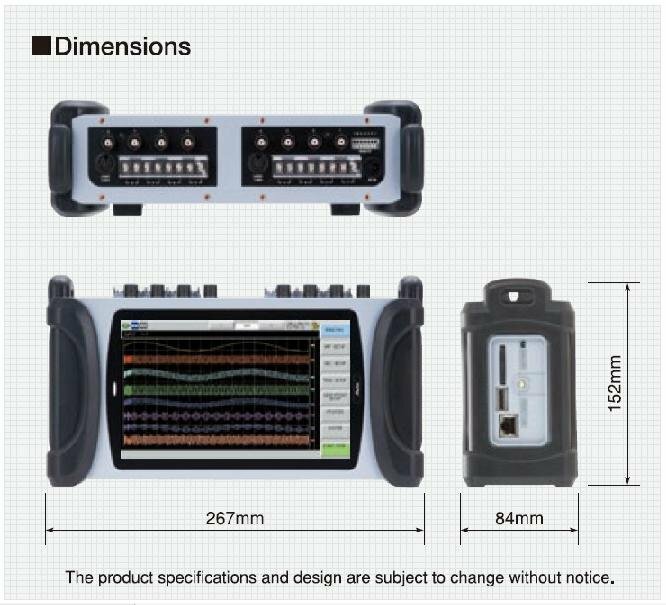 This AC or battery operated recorder with rugged casing satisfies your different requirements for Predictive Maintenance, Quality Control, R&D, Automotive Drive Testing and remote-controlled data acquisition. 4 channels (RM1101) or 8 channels (RM1102) of both Voltage/Temperature and Logic Inputs. Dynamic waveform display on 7" wide & large LCD. 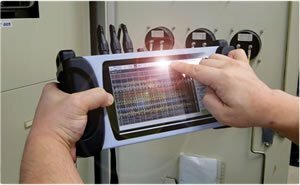 Touch-screen with GUI offers easy operation. Wide operating temperature range of -20°C to +60°C, compact & rugged case endures dusty and humid environments. Long term continuous operation with rechargeable batteries. Can also be powered with 8.5 to 24VDC as well as AC adapter. The RM1100 is lightweight at approximately 1.5Kg with full measuring capabilities. Three measuring modes available: Real-time (paper), Memory (Snap-shot / transient) and Filing Mode (SD card storage). High speed recording up to 1µS to Memory or SD card. Long term recording to SD Card, PC or optional Thermal Chart Printer. 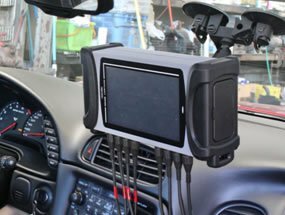 The wide 7" LCD allows dynamic waveform display of up to 8 channels. Users can also set numeric value and waveform screen divisions for various purposes. Recorded waveform data of selected channels can also be printed in different formats; by channel or overlapping, etc. Signal position and amplitude can be easily ajusted independently for each channel. 4 or 8 channels of Voltage/Temperature Inputs and Logic Inputs. Wide Voltage input range from +/-100mV to +/-500V Fullscale. Thermocouple inputs using type R, T, J, K and W Thermocouples. 4/8 channels of Logic inputs, selectable between voltage or contact input for each channel. Control the RM1100 via Ethernet and also read saved data from the SD card. Parallel display of Record & Playback screens: Display Digital Data, Y-T graphs, X-Y Graphs and Bitmap data on screen with customized layouts. Inserts comments or arrows to waveforms on screen and print the images for reporting. Arithmetic, Calculus and Trigonometric functions, FFT, etc. using real-time or post-acquisition data. Trigger Source: Voltage/Temperature inputs or logic inputs. 4 or 8 channels. Dust / Splash Proof IP41 (IEC60529) when optional RM11-402 splash-resistant cover is used.